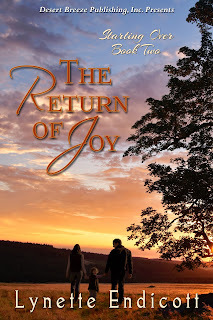 I've had the pleasure of meeting author Lynette Endicott through Goodreads and Twitter and am happy to announce the publication of her latest novel The Return of Joy (Starting Over Series Book Two). She is graciously sharing an excerpt from her new novel as well as the book trailer. You can also find more information about her novel, More Than A Job, the first book in this series. 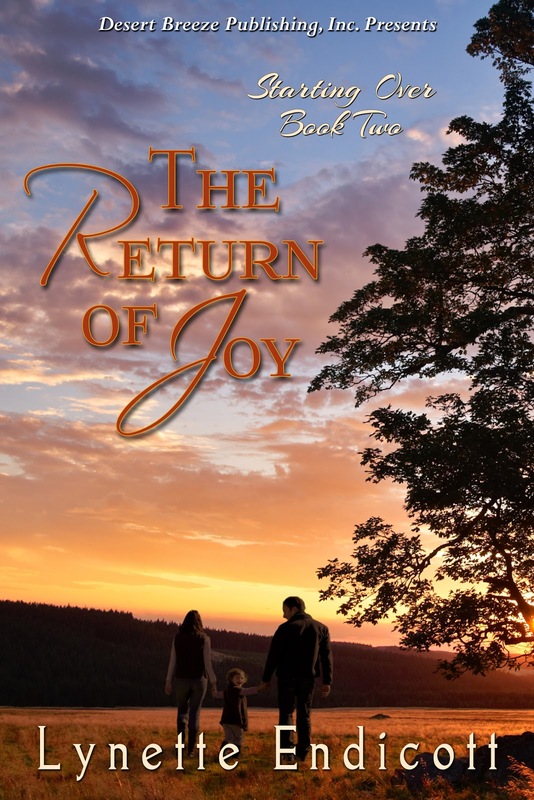 Joy's sadness at the loss of her husband has buried her in despair. Will a change of scenery help her live again, or will the danger around Steve's death engulf her and her young daughter? Can Mark keep them safe - and win her love? The creaky board in the hall gave Joy away. Ah, so she was up. At the sound, Evelyn turned and handed her daughter-in-law a steaming mug of Earl Grey tea. She didn't speak. Instead, she took in the dark smudges under Joy’s eyes and the yawn she let escape despite her best efforts. The older woman waited to speak, knowing Joy needed her caffeine first. Evelyn took the early duties in the house, because facing morning was so difficult for Joy. Gone was the vivacious woman who had captured Steve's heart and swept into his life in a whirlwind of excitement. Evelyn had been the matchmaker for those two. With the same unerring instincts that had led her to introduce her friend to her son, she had known how to lend Joy strength when their marriage had ended with his death. "The last thing Steve said to me," Evelyn had told Joy, "must have been a premonition." Joy had looked up from her tears, from the bed where she had just given birth to Charity, with confusion in her eyes. "'Take care of Joy'," he said to me. "'If anything happens, you'll take care of my Joy, won't you?' And I will." I'm still taking care of her. Joy had needed Evelyn then, and she needed her now. A new mother couldn't deal with planning a funeral. Evelyn had picked out the casket and planned the service. She got Joy through the condolences and the days and weeks after the funeral. She pushed down her own pain at losing her son so that she could support his little family. She'd handled everything -- everything -- and given Joy time to heal. Her new job was to protect and care for Joy and Charity. She had been there when Joy struggled to move from one day to the next. Evelyn had helped Joy get back into her business -- now home-based, because of the baby. Who else could call clients and make appointments, prod Joy to move back into the world, and cover for her when she couldn't work? Moving in with Joy had come naturally. After all, living with her was much more convenient, and during months of lower productivity, sharing costs would help them both. Joy needed so much from Evelyn. The older woman had given up her privacy and independence because she wanted to take care of her new granddaughter and the woman who’d given the child life. She'd promised Steve. Besides, they were family. Evelyn was there this morning, ready to listen, as always. She finished cooking breakfast and set plates of steaming food on the table. She'd never been good at staying still. She refilled Charity's cup with juice, encouraged the little girl to wipe her mouth, and then pulled her chair up beside Joy to eat her own meal. When Joy set down her mug and sighed, Evelyn turned to her and asked, "Long night?" Joy nodded and ran a hand through her dark curls as she stared at her plate. Smudges under her eyes and the tightness of strain around her mouth made her look older than her thirty-three years. "I had the dream again." She shook her head and toyed with her food, pushing the eggs around on her plate. Evelyn wished Joy had more of an appetite. "Evelyn, I can't take it anymore." "The dream at the cabin where Steve calls out to you?" She poured Joy a second cup of tea. At her daughter-in-law's nod, she asked, "What are you going to do?" Joy took a tentative bite of toast. "I'm already packed. I hope you'll come with us." She took another bite, and then another. Evelyn was pleased to see her eating so well. Maybe this decision was what she'd needed. Of course she would go. Joy and Charity were her responsibility. She wouldn't think of staying behind. "How long will we be gone?" "Oh," Joy hesitated, staring at her hand and twisting her wedding band. Evelyn noted her hesitation and feared for a moment that she might decide to stay buried here in St. Louis after all. "You should have seen Steve's eyes, Evelyn," Joy finally said, her look confused and unsure. "Calling to me, so urgently. I think..."
Evelyn waited for her to continue. Joy twisted the wedding band again. "I think he wants us to go." She looked up, her eyes begging her friend to understand. "It's weird, I know, but the dreams..." She hesitated again. Where was this girl's confidence? "I don't know how long we'll stay. I just know I need to go. Maybe we'll make a vacation of it. Maybe we'll work from there for awhile. I don't know." Evelyn nodded. She'd go with Joy and take care of her as she always did. "I'll clear our calendars." She grabbed a pen and paper and started a list, before Joy lost her burst of courage and changed her mind. "I assume we want to fly?" "I suppose it's too far to drive." Joy grimaced. Evelyn smiled. "Well, it can be done in a couple of days, but they'd be long days, harder on everyone, especially with Charity. So yes, it's too far to drive." Evelyn leaned down to her granddaughter. "Did you hear, baby? We are going for a trip on an airplane. Do you want to fly on a big steel birdie?" The little girl grinned, nodding in excitement. "Big steel birdie." she repeated, laughing. "You have plenty of your patches for airsickness?" Evelyn turned back to Joy. At her daughter-in-law's nod, she continued. "Okay, then. I need to make reservations for sometime in the next couple of days. Turn off the water. Cancel the paper. Forward the mail and our calls--"
"I'll get some cash, pack the computer and some current projects, and arrange our ground transportation," Joy added, surprising Evelyn. She nodded, still planning in her mind. "Mark, the caretaker, will meet us, I think. Or leave us a vehicle. The old Suburban is still up at the place from Steve's last trip. He left it there and flew home." "Okay, ask the caretaker about that. We can each check two bags and carry on -- which is it? One or two?" Was there a hint of excitement in Joy's voice? Excitement was healthy. "Two. But we don't really want to wrestle a lot of bags, do we?" "Well, if we end up working while we are there we'll need all our office things." "Don’t worry too much about work. I thought you said this is a vacation." Evelyn wasn't going to let Joy bury herself up there. A break would do them all some good. "Surely just one laptop will do for this trip. We don't have anything pressing right now. If we check our email and keep in touch by cell, our clients will manage for a few weeks, maybe longer." Joy conceded. "You're right. We shouldn’t need much. Most of our design and communication is electronic anyway. I suppose we'll have internet up there." In the middle of the conversation, Charity banged her spoon on the table, laughing and singing, "Going to fly on a big steel birdie. Going to see Daddy, going to see Daddy." Both women stopped mid-plan. "She said something similar last night," Joy told her. "I don't know what to make of it." Evelyn nodded and put an arm around the younger woman's shoulders. Side by side, the two of them watched the laughing child. "You don't have to understand," Evelyn bobbed her head toward Charity's beaming face. "This confirms it's time. Children have impeccable instincts." When Paige Hamilton is fired from her 10-year career, it is Josh Robinson who helps her pick up the pieces. A team of family members and friends walk with her as she starts a journey to a new life. All that is threatened when she learns who Joshua really is and blames him for a life-threatening injury to a close friend. Nothing like front end success to keep her writing! Lynette enjoys reading contemporary romance and speculative fiction and writes both. 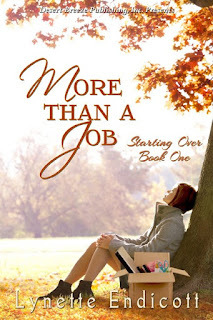 Her debut book, Starting Over Book One: More Than A Job, and Time After Time Saga: Animal Instinct (with Tami Dee) are available now. Starting Over Book Two: The Return of Joy releases October 21, 2012. Because she didn't have pets until after her 50th birthday the animals she enjoys find their way into all her books. Usually you will also find a character with a disability as part of the day to day fabric of the story. In More Than A Job, Paige works in services to people with disabilities until she loses her job and starts over. In the Time After Time series animal helpers assist the hero and heroine in all six of the books in the series.